24/12/2013 Merry Christmas from Weddington Castle! Click here to view our eCard to you. 19/12/2013 Extra information on use of Castle materials after its demolition added to 'History' section. 11/12/2013 8 historical images of Astley Castle and Church (c) Nuneaton News added to 'Picture Gallery'. 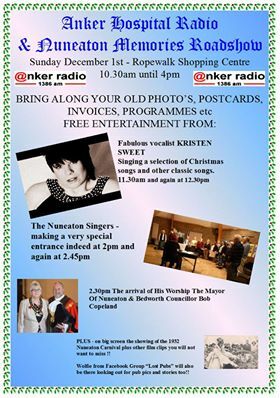 01/12/2013 Message from the excellent 'Nuneaton Memories' group - "NEXT SUNDAY DECEMBER 1st - pop and see us at Ropewalk (near the Christmas tree) and bring along any old pictures, postcards, tickets, bills / interesting ephemera etc so we can scan it it and share with the group. Wolfie from "Nuneaton & Bedworths Lost Pubs" will also be there as well as some of our admin team.... a full day of entertainment has also been laid on by us and Anker Hospital Radio." Read the flyer here. 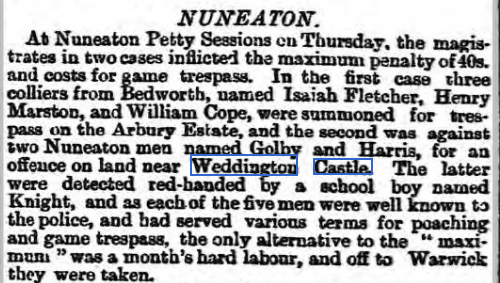 20/11/2013 A modest grant has been applied for from Nuneaton Council to promote Weddington Castle website to schools and local groups. More soon. 18/11/2013 'Nuneaton in My Blood' talk by Michael Roberts at Nuneaton Local History Group on 22nd November. See the flyer here. 26/10/2013 'Local Halls' and 'Updates' section now moved over to new site. We have been informed by our hosting company that the previous site will be deleted on February 1st 2014 so all files need to be moved over by then! 19/10/2013 The Castle Shop is now open for business! 13/10/2013 Image of Henry Cunliffe Shawe from 1902 added to website.